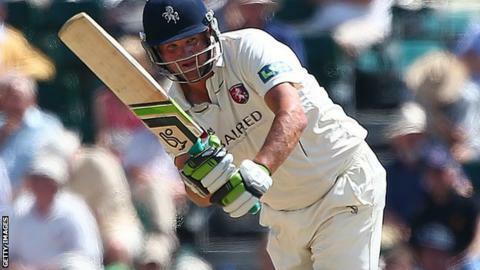 Rob Key's first century for Kent since May 2014 held up Lancashire's bid to seal promotion from Division Two of the County Championship at Canterbury. After winning the toss and a rain-affected morning session, leaders Lancashire had to be patient. Tom Bailey dismissed Daniel Bell-Drummond (37) lbw before Key and Joe Denly registered a century partnership. Key brought up his 53rd first-class ton with an all-run four, but he and Denly were dismissed by Jordan Clark late on. "I have to admit this ton has felt a long time coming. I've got close on a couple of occasions this year and when you miss out it starts to add pressure when you next get close to three figures. "It was nice to get over the line today mind. "It was wet out there and a slow pitch, a good toss to lose maybe, but there was a little bit in it and there were times I just had to tough it out against the likes of Glen Chapple, who's still a fantastic bowler."